It's important to reflect why we started our businesses in the first place when hard economic times affect our companies. Whether you started because you have a unique natural talent, a burning passion or a strong personal drive, you are being tested now. That is why we need to stick together and help each other. Karla of Krueger Graphics, Inc. turned her passion into a livelihood that has lasted 25 years. She grew up in the family businesses of her parents and grandparents where she learned to understand the business owner's perspective. She is one of those rare individuals who is talented in the creative arts and who also understands how to apply those skills to achieve business objectives. Always the entrepreneur, she recognized early on the efficiencies and improved quality that computer-generated graphics could achieve. 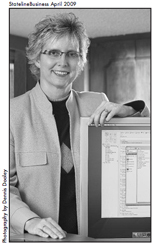 She invested in the best system on the market to become the first in the area to offer computerized graphic service. Today, years later, Karla is highly proficient in the latest technologies. She produces images at a level that can compete with the high-speed visuals today's customers are accustomed to seeing. But Karla says technology is only a tool. "Listening to our clients, understanding their market position, their goals and their customer base is the absolute most important part of our business. We focus on helping our clients attract customers and sell their products or services. We want to help you develop a unique image that sets your business apart from the competition." "Karla's approach to business and the required marketing is intense, thorough, and very effective. Her can-do attitude is more positive than any other outside contractor I work with. It is not 'work' with Karla - it is successful effective accomplishment - project after project." - Terri Roessler, CEO of United Alloy, Inc.
"It is hard to find people who are thoughtful, responsive and thorough in today's culture of poor customer service, but we know we can always count on you." "When you said a piece would be ready, it was ready. The materials you designed for us far exceeded my expectations. Comments we have received have been very complimentary. You have 'redefined' our company's image." - Barbara Boyd, Partner, Boyd Consulting Group, Inc. In addition to larger clients, Karla says they serve many, many smaller companies. "Regardless of your budget or the size of your business, you are a major account to Krueger Graphics. We value your business as if it was our own."